Trained with top trainers, both here and abroad. Won two bursarys the ABRS for training with Pammy Hutton at Talland. Louise has been successful competing to BE Intermediate level and Foxhunter level BS. More recently Louise has been successful showing and training young horses including this year winner and champion and Royal Cornwall show and Cuddy final with her super find Barfield's Madison. 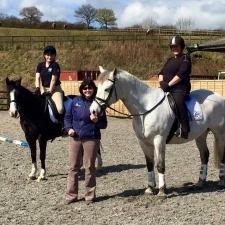 Louise runs courses in Riding and Road safety, PRT, and BHS preparation. She is a pannel judge for veteran Horse Society, Probationary Examiner and on the SW regional BHS committee. She is very active running clinic's in Pole work, Jumping and XC. Specialising in Confidence building.